By adding digital signage, the Township projects a professional and modern look that effectively and efficiently communicates with surrounding area. 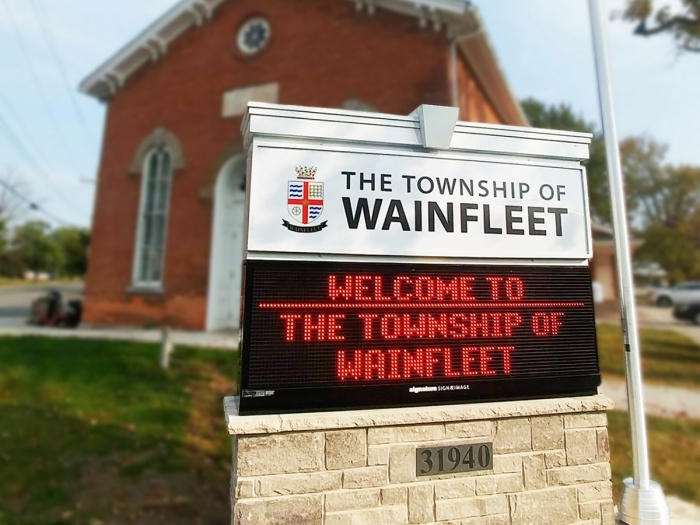 Once the sign was installed, the inaugural message was “Welcome to Wainfleet”. Now the 8’3” x 7’ pylon structure supports a new 19mm, monochrome 2’5” x 7’3” digital sign that promotes events and informs the community about what’s new in the city of Wainfleet. “We have seen an increase in participation in local community events, and many residents have even commented on how well the modern yet classic design compliments the historic city hall building,” said Richard Nan, Wainfleet Township’s manager of operations. The Township sees digital signage as a more attractive way to communicate messages to the community. They’re extremely pleased with their new Watchfire sign, and see it as a way for their small, rural town to communicate important messages easily and quickly to residents and tourists.